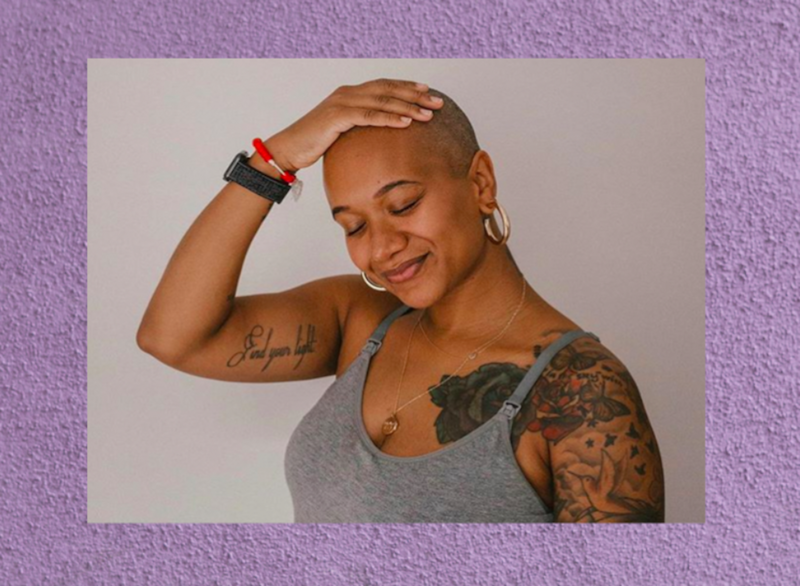 Alexandra Elle, wellness consultant, author, poet, and mother, has built her career off of encouraging others—especially women of color—to practice self-care, heal, and live out loud. Elle’s Instagram alone functions as a home for her poetry and affirmations, as well as intimate glimpses into her personal life and her family. It’s safe to say that any one of Elle’s nearly half-million followers can find solace in her words, which often remind those who read them that they are whole, that they are not alone, and that there is often triumph on the other side of trauma. Elle’s raw and insightful reflections can also be found outside of her Instagram and Twitter pages, and in full written works like Neon Soul, a collection of poetry and prose, or #ANoteToSelf Meditation Journal, where she encourages readers to journal as a meditative practice and as pathway to self-discovery. Ahead of the release of her latest guidebook, Today I Affirm (available on January 1, 2019), and her latest partnership with LARABAR, we spoke to Elle about why she journals daily, how Black women can practice radical self-love, and what “wellness” means to her. Read our conversation below. HelloGiggles (HG): You have written numerous books and journals that are meant to help people pause and reflect. What inspired you to create Today I Affirm, and how has the practice of journaling impacted your life? Alexandra Elle (AE): I was inspired to create Today I Affirm as a resource to support the development of writing and self-care practice, something to assist others in finding their own voices in a way that’s not overwhelming. If I had a tool like this years ago when I needed it, I strongly feel that it’s very possible that I would have nestled into my story without shame or guilt sooner than I did. Peeling back our emotional layers is an intense process, but we have the power to be our greatest teacher when we use writing in our moments of self-reflection. The practice of journaling has greatly impacted my life. Personally, I use writing as therapy—it’s very scary at first to reach back and pull things up; to sort through, unpack, look at those things. I would encourage folks to do that when they have the emotional space. We can’t expect things to heal on their own. If you can’t go to a therapist, I think the safest place to start unpacking is in a journal. HG: Today I Affirm is a journal that “nurtures self-care.” Self-care has been something of a buzzword for the past few years, but true self-care means more than face masks and bubble baths. What is your personal definition of self-care, and what is a non-negotiable part of your self-care routine? AE: For me, self-care teaches that I can pour into myself just as much as I pour into others. In fact, it means that in order to put the most love and care towards others that I can, I must take care of myself first. A lot of people believe that self-care has to be expensive and lavish, but it doesn’t. It can mean something as simple as making sure that you take five minutes to decompress every day. Take time to breathe. We are moving so quickly that sometimes we don’t even realize we’re breathing! Remember to be here and be present—that’s a non-negotiable for me. It really is amazing what taking five minutes—or whatever you can spare—just to be present can do for the rest of your day. I always challenge my clients to take a few minutes to breathe, walk a lap around the office, or meditate. It’s amazing how much better they feel once they do this. HG: As women of color, and Black women especially, the world often looks to us to perform emotional labor and save others. What comes to mind when you think about “self-love,” and why is it so important for Black women to practice radical self-love? AE: When I think of self- love, I’m reminded that it taught me empathy, compassion, and the fact that showing up fully must start from within. Just like you would pay extra attention to your well-being when you are sick, you should pay attention to yourself to perpetuate wellness. Make a habit of taking 10-15 minutes to pause throughout the day and go through your “self-love checklist.” Think to yourself: Have I been nourishing my body properly? Have I taken five minutes to decompress and just be in silence? Have I called that one friend that lifts my spirits? Have I worked out? Have I written in my journal? Whatever it might be, get to know the things that you need to be well, and then make sure you’re making time for them as often as possible. I have a mantra: “Take care of you, take care of them, in that order.” Self-care is so essential, because if you don’t put it into practice, you can’t put the time, effort and love you want to towards those people that are important to you. I was raised, specifically as a Black woman, to take care of everyone else and put myself last, and that’s not self-sustaining. There’s this idea that you’re the matriarch, you’re going to hold everything together. But that’s really devastating to the self. For me, if I’m not full, I can’t share my wealth with anyone else. I look at it as, like, water—I want to be a full pitcher, so that I can pour into my daughters’ cups, so that I can pour into my husband’s cup, my friends’ cups. I must take care of myself first. To me, prioritizing this is the most radical act of self-love, because in return, it allows you to more fully love those around you. HG: You also wrote Growing In Gratitude: 150 Days Of Expressing Thanks. Why is it important to practice gratitude on a daily basis, and what are some of your favorite exercises for expressing gratitude? AE: Writing things on paper brings us closer to our inner selves and helps us understand ourselves. We’re all blessed; take time to acknowledge that daily. To implement this, one of my favorite practices is to use the Growing in Gratitude journal with my 11-year-old daughter. Writing together brings us closer and helps us share and understand that, hey, we’re really fortunate in this life. In the journal, specifically, we list three things below “Today I am grateful for…” and do the same under “Because I have…I will give…” I think that’s important, giving back. It just goes to show how to be thankful for things that we have. It’s a good mindfulness practice not only for kids but for adults, too. HG: Affirmations are a huge focus of your overall platform, not just in your new journal. What role have affirmations played in your personal wellness journey, and how can they help others? AE: To me, affirmations create space for us to relax, reflect, reset, and rearrange our personal narratives. Peeling back our emotional layers is an intense process, but we have the power to be our greatest teacher with the right self-reflection practices. Personally, affirming myself has taught me that I have the power to be kind to myself, even with my flaws and shortcomings. When I teach at retreats, I have students do what’s called the “Mirror Exercise,” where they stand together with a partner. One acts as the mirror, while the other says “I am” affirmations for 60 seconds, not breaking eye contact. The “mirror” listens, and then they switch. Standing together is a radical act of community building, and we all need to know that we’re better together. This always reminds me of how far an affirmation really can go. We all know that “glowing” feeling that we get when we receive an unexpected compliment, genuine praise on something we’ve worked hard on, or even just a listening ear confirming you’re okay. Self-affirmations can have that same impact. HG: What does “wellness” mean to you? AE: Wellness is the core of everything that we do—how we handle ourselves and those around us. As I said earlier, if we don’t maintain our personal wellness, we can’t sufficiently put 100% effort into our personal relationships, parenting, our careers, our friendships, and so many other things around us. To me, “wellness” is the heartbeat of our lives. It keeps everything flowing. Without practicing wellness, nothing else can function up to its full potential. You have to show up for yourself in way that no one else can; don’t underestimate the value of this!